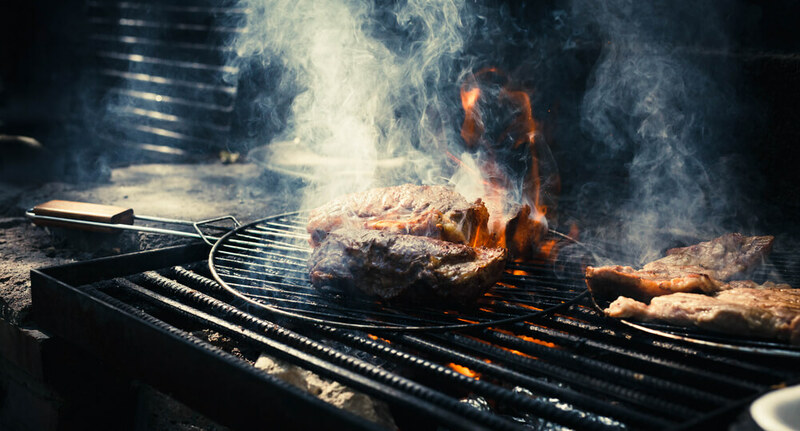 Different types of wood are commonly used when smoking meats to add enhanced levels of taste, smell and color, as well as flavors like cherry, oak, peach, hickory, nuttiness, and apple to the meat. Wood can also add bitter, and more savory, rich hints to the meat. Knowing which type of wood to use in conjunction with the meat that you are smoking starts with knowing the difference between types of wood, and what flavors will develop as a result while it smokes. You also want to consider whether to use wood chips or wood chunks for smoking, as the size of the wood used will affect the flavor as well. Chunks burn slower, releasing the smoke and flavor with time, whereas chips burn faster and hotter, and will release the smoke quickly, and in bursts. Meats that require a much longer cooking time- like brisket, or ribs- will smoke better with wood chunks to slowly release the flavor into the meat. In addition to the consideration of the size of the wood, using the wrong type of wood chips can result in overpowering your meat, instead of introducing a light, balanced flavor that is pleasing to the palate. However, using the right wood, or even a nice blend will enhance the flavor overall. Today, we are discussing the differences between oak and mesquite wood for smoking. Oak has a mid-range flavor and is commonly used for meats. Oak works especially well with pork but also pairs well with poultry and beef. Oak also adds a nice, deep hue of brown, mahogany color to the meat as it smokes it. Using oak with other woods, like hickory and light fruits, like pear adds a nice, calm balance for poultry and different types of fish- as well as vegetables or nuts. Mesquite wood imparts a strong and defined flavor that is all its own in the meat as it smokes. Mesquite is one of the hottest-burning woods. Therefore, mesquite should be used harmoniously, and with care. It’s rare to use mesquite on its own to smoke. Mesquite wood pairs well with other woods, like oak, hickory and sweet, rich flavors like cherry or apple. Mesquite should also be given a limited amount of time to smoke your meat, or it will be at risk of becoming overpowered by the distinctive flavor. Using woods when smoking is like using seasoning for meats. You want the wood to work with one another as spices do. The right, balanced blend will add a unique level of depth to the flavor of your food. Over-smoking your food is the worst mistake you can make when preparing your meat and poultry in a smoker. Over-smoking results in the taste of the smoke winning over the natural flavor of the meat. Unfortunately, all your guests and family will taste is the overpowering flavor of the smoke. Thus, use the wood to smoke your food in moderation to achieve balance. For best results, you should keep the wood in for only about half the time the meat is required to cook. Don’t feel like smoking your own meats? We got ya covered at Drakes Yoke!